There was more passion, news, and fireworks in today’s edition of Meet The Press than in any I can recall. This week’s broadcast began with Andrea Mitchell of NBC News and the New York Times‘ Tom Friedman discussing the unfolding war between Israel and Palestine. Friedman says Hamas’ goals are to end the blockade of Gaza, end the Israel’s targeted killing of Hamas leaders, and to take advantage of new leadership in the region created by the Arab Spring. Israel on the other hand, according to Friedman, has been increasingly worried about the longer and longer range missiles Hamas has been smuggling into Gaza. Egypt is trapped between its solidarity with regional Muslim leadership and promises made to the United States in return for aid. Meanwhile, Iran and Syria are both happy to have the attention taken away from them and their situations. Mitchell says to United States wants Egypt’s help in getting Hamas to pull back from the rocket attacks on Israel. That help, however, is not as reliable as it might’ve been under the old regime of Hosni Mubarak. Later in the broadcast, Senator Lindsey Graham (R-SC) issued an unsolicited warding to Egypt saying that the Congress is watching what they’re doing, saying, “If you keep inciting violence between the Israelis and the Palestinians,” Egypt will be teetering on the brink of losing their aid from the United States. 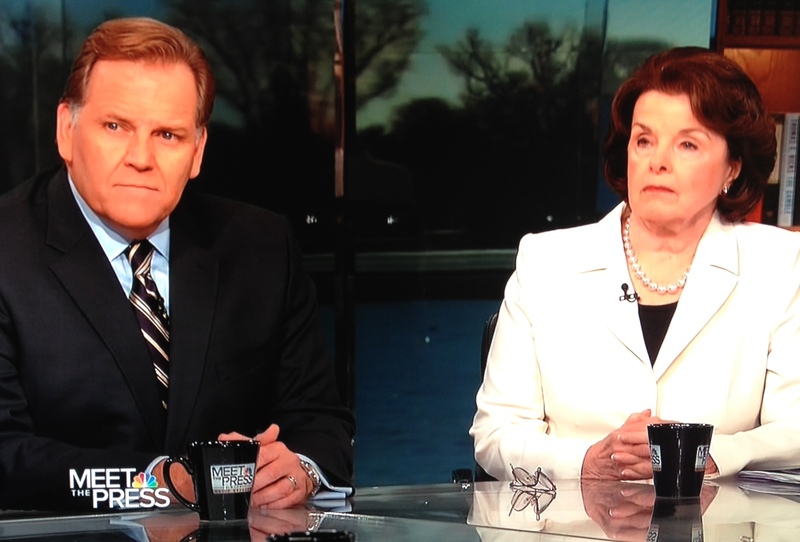 Next up was Congressman Mike Rogers (R-MI), chair of the House Intelligence Committee, and Senator Dianne Feinstein (D-CA), chair of the Senate Intelligence Committee, to discuss the investigation into attacks on the US consulate in Benghazi, Libya as well as the scandal surrounding the resignation of CIA director David Petraeus. Congressman Rogers said the first question we have to answer is: Was there an intelligence failure which led to the Benghazi attack? He says that, with everything he has seen, he has a high degree of confidence that there was not an intelligence failure. In describing how and why the attack took place, Rogers said, “The intelligence community had it right and they had it right early.” Rogers claims that those intelligence reports then got changed in talking points prepared by political appointees before they were given to Amb. Rice. Rogers aims to learns how the changes transpired. Rogers speculated that perhaps the Attorney General had informally told President Obama about the situation earlier. Gregory pressed him on this, and Rogers had no evidence to support the allegation. Sen. Feinstein concurred that there is no evidence for such allegation. Later in the broadcast, Andrea Mitchell said that by making these allegations, Congressman Rogers had thrown a hand grenade into the middle of the conversation. Next up was Senator Lindsey Graham (R-SC) who very quickly said that Amb. Rice’s testimony was driven by politics, that she was trying to keep alive the narrative that said the Obama administration had defeated Al Qaeda. Graham said he is not interested in the Petraeus affair unless there is a national security component. Contrary to the Rogers allegation, Graham seemed to think it quite possible that the president did not know about this scandal until election day. Presidential campaign politics did make one final appearance in the broadcast. Gregory asked Sen. Graham to respond to remarks by former Republican presidential nominee Mitt Romney that President Obama won reelection by giving gifts to big parts of his base coalition. Graham shook his head multiple times and said the Republican party is in a big hole and will not get out of it by making comments like that. In the final roundtable, GOP strategist Mike Murphy notes that the Republicans have lost the popular vote in five out of the last six presidential elections. He says the party has a fundamental problem with policy, not necessarily the mechanics of running campaigns.